As resistance bands are stretched, the tension on them increases, which in turn provides resistance that your muscles have to overcome. 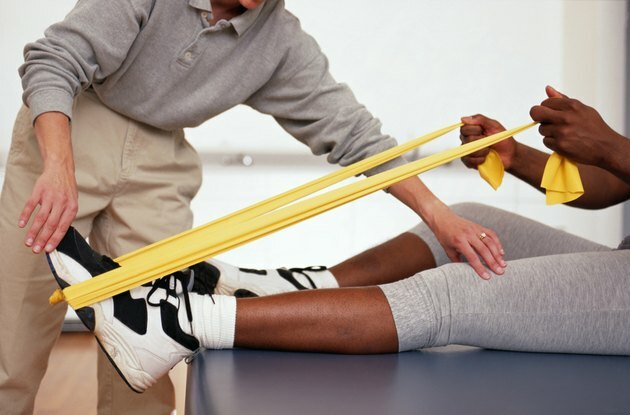 You can use a band to strengthen your two major calf muscles, which include your gastrocnemius and soleus. These two muscles are responsible for plantar flexing the ankle joint, which means they pull the balls off your feet down toward your heels. Use the exercise band to provide resistance as you perform an array of calf raise exercises. To strengthen your calves while sitting on the floor, keep one leg extended in front of you and wrap the band around the balls of your feet, gripping each end with your hands. Pull the ends toward your torso to create tension. Begin with your foot pointed directly vertical and then press the balls of your feet away from you, against the resistance of the band. Control your foot back to the starting position and repeat. Switch legs after you're finished with the set. If you prefer to strengthen your calves while seated in a chair, you can do so by extending one leg out in front of you and resting your heel on the floor. Wrap the band around the ball of your foot and hold the end of each band with your hands. Start with your foot pointed vertical and then pull the ball of your foot away from you, plantar flexing your ankle. Return your foot back to the starting position to complete the rep and then repeat until you've completed all assigned reps. Switch legs after you're finished. Strengthen your calves while standing while using a resistance band with standing calf raises. Step onto a band so that it's positioned under the balls of your feet and grab each end in your hands. Lift your hands so that they're at your shoulders, with your elbows positioned under your wrists. Raise your heels up off the floor as high as you can and then lower them back to the floor to complete the rep. Incorporate two to three calf workouts into your weekly regimen. Schedule the workout sessions so that they fall on nonconsecutive days. Perform a 10- to 15-minute warm-up, including light cardio, before each workout. Always inspect the bands for small tears or excessive wear before beginning a workout session. Complete one to two sets of 12 to 15 reps of each exercise. Make each calf exercise challenging and effective by adjusting the resistance on the bands by pulling it tighter.